Consider the possibility of musical history not recording Turandot and the most famous aria of them all, Nessun Dorma. It is a sobering thought, but the fact is that Giacomo Puccini succumbed to cancer before he could finish this great work, his final opera. Had it not been for the collaboration of the Italian composer, Franco Alfano, who completed the final act from Puccini’s sketches, Turandot might not have seen the light of day at all. One can imagine the shock of the audience on the first night on 25 April 1926 when Arturo Toscanini, musical director of La Scala in Milan where Turandot received its premiere, is reputed to have put down his baton in the middle of the third act, ending the performance with the opera unfinished and the dramatic declaration that it was at this point that the master (Puccini) had stopped writing. Subsequent performances included Alfano’s conclusion, allowing the full story of Turandot to be told. Set in China, any man seeking to win the hand of the beautiful but heartless Princess Turandot must solve three riddles; failure to answer them correctly will result in death. Prince Calàf accepts and wins the challenge only for Turandot to deny him. It is then his turn to ask the princess an impossible question, with fatal consequences. Turandot is one of the most sumptuous operas ever staged and a prime example of the genre’s growing interest in exoticism in the first decades of the twentieth century. 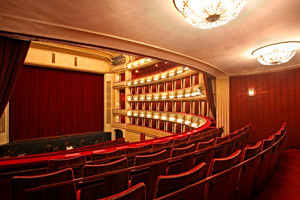 It was staged in the Austrian capital for the first time in the October of 1926 and the Vienna State Opera is delighted to bring Turandot once again to Viennese audiences.